Misamis Oriental is envisioned to be a leading tourist destination, a center for economic growth, a healthy environment with cultured, prosperous, resilient and empowered people living in a stable and enduring peace and order situation. 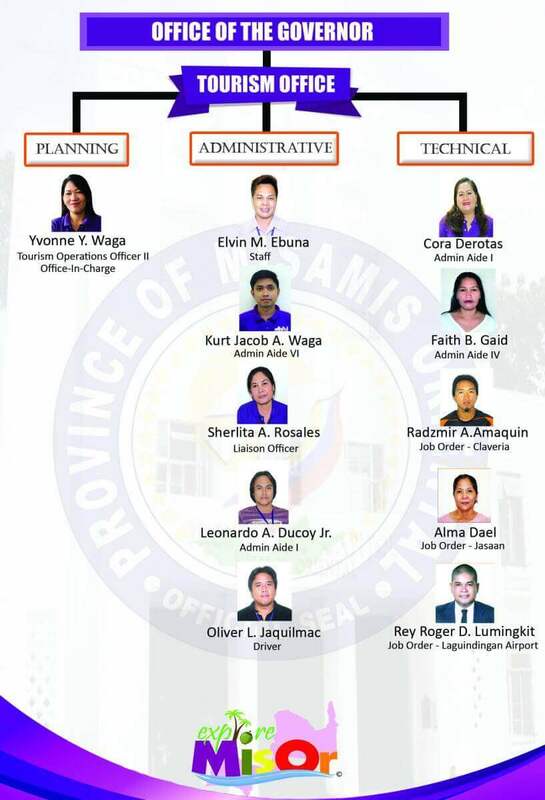 The Provincial Government of Misamis Oriental’s direction and flagship program banks on the core principle of good governance envisioning Misamis Oriental to be “the leading eco-tourism destination” and center for economic growth. In line with this vision, it is necessary to make sure that the whole Province of Misamis Oriental if not the whole country be informed and made knowledgeable of various Tourist Destination Areas, the province being a haven of local beauty and talents. The whole country will celebrate “National Tourism Week” in the month of September 2015. The Province of Misamis Oriental will participate in the celebrations highlighting the show case of tourist destinations from every municipalities, as well as , showcasing of talents through the cultural show from every municipalities. Exhibits was conducted at SM City to capture the middle class audience to appreciate its objectives. various provinces and cities in region 10. It Highlight the beauty and products of the provinces to help promote and advertise the different produce of each participating LGU’s and stakeholders. It is also a major regional promotion project of the Department of Tourism Region 10 and Northern Mindanao Regional Tourism Council. The participation of Misamis Oriental is within the tourism flagship program of the Provincial Governor Yevgeny Vincente B. Emano. The primary objective of the said activity is capturing the Luzon market. Misamis Oriental has identified sites to be developed for the next years, it is but fitting that promotions starts today. Nature adventure seekers are specifically targeted as of the moment. The increase of the popularity of trekking in nature trails have been increasing in interest and popularity the past years, and it is timely that the province aligns such with the promotional and marketing strategies for ecotourism. Presented the Province’s Eight (8) Tourism Sites in Pampangga City. Showcased Misamis Oriental’s various products and festivals. Promoted the province’s tourism activities.